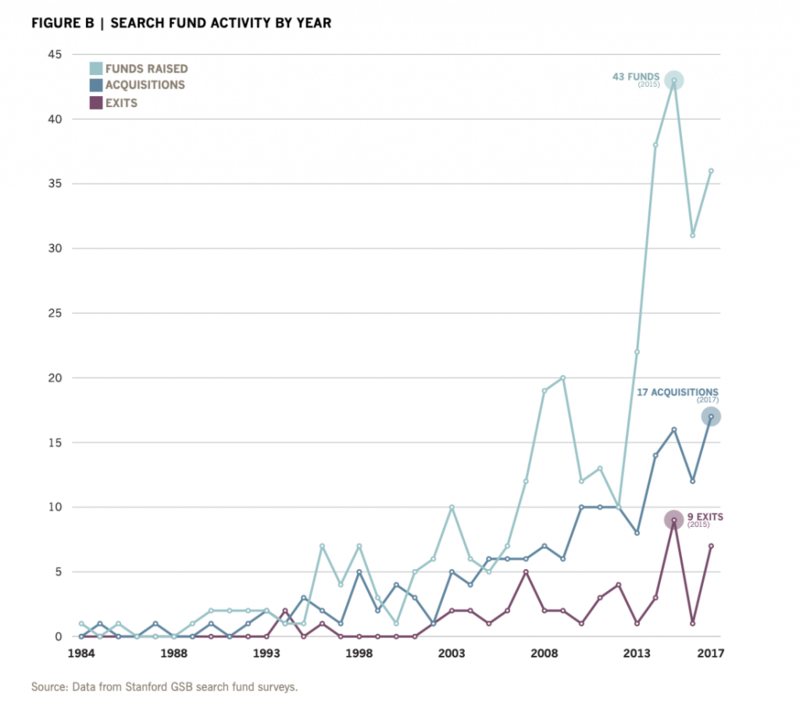 Today, the number of active search funds is at an all-time high, according to Stanford’s 2018 Search Fund Study. A record 17 companies were acquired by search fund entrepreneurs in 2017, according to the study. Since the first search fund was formed in 1984, investors have put $924 million of equity capital into these investment vehicles, with a total equity value of $5.7 billion for investors and $1.5 billion for entrepreneurs. In the traditional search fund model, one or two people — typically recent MBAs — raise capital from a group of investors to find, acquire, and run a private company. Though search funds are a niche investment model to be sure and these are small numbers, they represent significant growth. The chart below, from Stanford’s study, shows the steady rise in funds raised and acquisitions over the past several years (the number of exits has not followed the same trend). As the number of search funds has increased, alternatives to the model have emerged. One is the so-called search fund “accelerator,” in which the aspiring entrepreneur is employed by a single firm which provides capital and advises on the search (rather than the searcher amassing a group of investors to fund their search as is in the traditional model). This is one form of what’s referred to as the “captive” model, in which searchers are funded by a single source. Search fund accelerators typically recruit a number of searchers each year, giving each member of the cohort the opportunity to share resources as well as providing general education and advising services. “We’re halfway between a search fund and an operator-centric private equity fund model,” says David Slenzak, Co-Founder and Managing Partner of Broadtree Partners. “All our searchers are employees of Broadtree Partners and get economics in their deals very much like a traditional search fund.” Broadtree raises money from LPs to back its organizations, and the searchers go back to those same LPs for the equity capital on each of their deals. 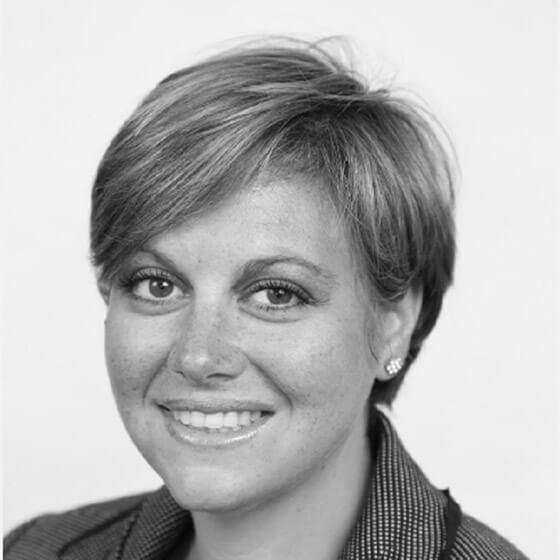 “We have the ability to go beyond our LP pool for gaps if those exist,” says Slenzak. Each year, Broadtree brings on around six searchers to join the team. The firm currently has 10 searchers on board. Bovard saw an opportunity to provide searchers a sense of support and community, much like startup accelerators like Y Combinator, which bring entrepreneurs together for a set of period of time, providing resources, mentorship, and access to investors. Since its founding in 2015, SFA has recruited a class of 4-5 searchers annually and is in the process of recruiting up to seven searchers for next year. SFA has a pool of committed capital to fund searchers’ acquisitions. It is too early to know whether this alternative search fund model will help combat the high failure rate of traditional search funds. But if it does, it may be because these firms provide an additional layer of scrutiny on the searchers themselves, only accepting those who they are confident will be successful in the CEO role. Maturity and a sense of trust is key. Often their relationship with the searcher/CEO will extend 10 years or longer — “longer than many marriages,” Bovard jokes. Obviously, the accelerator model is extremely hands-on when it comes to screening candidates. For some proponents of traditional search funds, this is anathema to the original model, which inherently rewards individuals with the desire and capability to self-select, raise capital for the search, and execute on the acquisition (not to mention run and ultimately exit the acquired company). “The traditional search fund model is the best way I’ve seen for an individual to create value while incentivizing alignment between the searcher and the investor. The traditional model attracts true entrepreneurs who would prefer to solve problems on their own rather than turn to a bureaucracy,” says one former searcher turned investor in search funds. So far, Search Fund Accelerator says it has seen promising success in the model. All of its 2015 and 2016 searchers have bought companies, save for one 2016 searcher who is about to go under LOI.